Walking through the grocery store, it is hard not to say our ooh’s and aah’s when we see a cute little baby or toddler. Complimenting a child, you don’t think twice if the parent is okay with it, or has any reservations about the lavishing. There are the rare cases, however, where a parent is not so quick to accept a praise, or the child may have an underlying cause of why they look the way they do. This is the case with the adorable little girl Mehlani. She has larger than life Disney princess eyes and gets complimented on them by strangers all the time. The only thing is that Mehlani’s eyes are the result of a rare condition that causes abnormal development of the eyes. Mehlani’s mother, Martinez, reported that her little angel was diagnosed with this tough syndrome when she was only a week old. Could you imagine having to hear that one of your daughter’s greatest physical qualities was going to be the cause of a lot pain in her life? Martinez was unfamiliar with the syndrome before Mehlani was diagnosed, but she quickly became knowledgeable on how their lives would change. “Axenfeld-Rieger syndrome affects the cornea and iris, so the eyes have a different appearance than most other people’s. The iris, which is the colored part of the eye, can appear small or misshapen. Extra holes in the iris can occur that make it look like there’s more than one pupil, or the pupil may be off-center. At such a young age, the poor little girl already suffers from glaucoma, but it has had no effect on her vision thus far. Glaucoma makes your eyes sensitive to light, so every time Mehlani goes outside she sports a pair of super cute pink sunglasses. Martinez has been torn on how to handle the comments she receives from strangers when they are out and about. 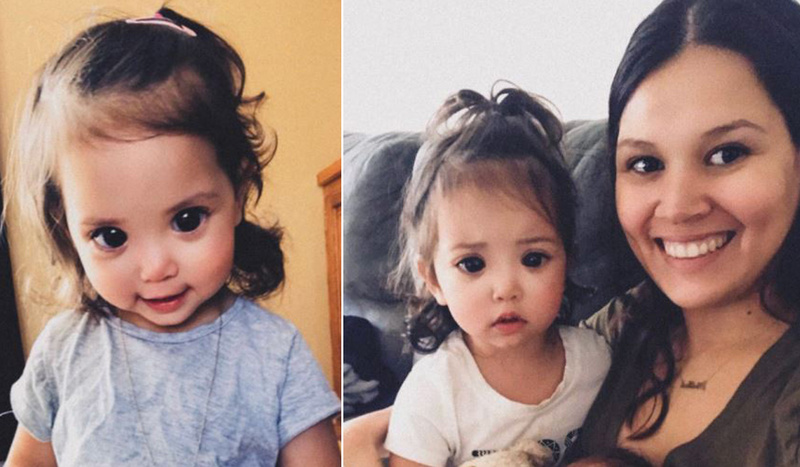 She doesn’t know if she should tell those giving compliments that her daughter looks that way because of a syndrome, or just accept the praise and move on. Martinez tweeted on the matter and has received an outpouring of responses and support from others dealing with similar issues, as well as empathetic readers. The tweet ends with Martinez sharing her deepest concern, in that her daughter always knows that she is beautiful despite her condition. School is another area of worry for the troubled mom. Martinez doesn’t want kids Mehlani comes into contact with to mistreat her for her different looks. Kids can be cruel, but Mehlani is probably safe seeming her syndrome gives her a unique look that adds to her cuteness. Martinez is handling the situation beautifully, telling her daughter all the right things to instill value in her. Having your child go through life being different than their peers can be extremely tough on parents and the child. Mehlani is blessed to have a mother who watches out for her mental and physical well-being. There will surely be more trying days ahead, but with the strong support system and unconditional love Mehlani has, she will be able to handle whatever life brings her. Please let us know in the comments section what you think about mentioning Mehlani’s condition when she is complimented.